The University of New Brunswick in Fredericton is home to the Quartermain Earth Science Centre thanks to a $1-million contribution by UNB alumnus and mining executive, Bob Quartermain. An event was held Wednesday on campus to officially open the centre. Located in UNB’s forestry and geology building, the centre includes dinosaur replicas, a large-scale display showing a journey to the centre of the earth, a working seismograph and a mineral showcase. It also houses a new teaching and computer lab and will serve as a repository for items and information important to New Brunswick and Fredericton geology. 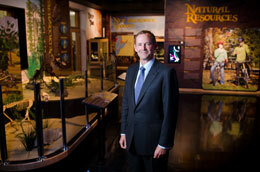 The centre’s curator, Adrian Park, will offer tours, making it a valuable outreach tool for UNB. Cliff Shaw, chair of UNB’s department of earth sciences says no matter which side of the resources / environmental protection argument you take, it is essential that you understand how the planet works. The centre, which is the only one of its kind in the province, would not have been possible without the generous support of Dr. Quartermain, whom the space is named after. Dr. Quartermain says the education that he received in New Brunswick and particularly at UNB, set the foundation that enabled him to successfully carry on his profession as a geologist at an international level. “My hope is that the centre will engage students at all levels to consider careers in the earth sciences, as we as an ever-increasing global society need to develop and utilize resources in a sustainable and environmentally sensitive manner,” said Dr. Quartermain. A native of St. Stephen, Dr. Quartermain graduated in 1977 from the University of New Brunswick with a bachelor of science degree in geology. In 1981, he graduated from Queen’s University with a master of science degree in mineral exploration. From 1976 to 1982, he worked for the Geological Survey of Canada and in private industry on mapping and exploration programs. After completing his M.Sc. at Queens, Dr. Quartermain joined Teck Resources and in 1985, was named president of Silver Standard Resources Inc., a position he held for 25 years, growing the company from a staff of two to a company with a market capitalization of $2 billion. In 2010, Dr. Quartermain left Silver Standard and in October rolled up his sleeves and started a new gold-silver company, Pretium Resources, a company that focuses on a new major precious metals district in Northern British Columbia. Dr. Quartermain not only donated $1 million to refurbish the department of earth sciences and develop this centre, but he has also set aside funds to support the ongoing development of the facility. Eddy Campbell, UNB president, says Dr. Quartermain may have made his career elsewhere, but he has deep roots in this province and his loyalty and commitment to the University of New Brunswick have been equally remarkable. He established the Silver Standard Arnie McAllister Fund, in honour of his mentor, a fund that provides the opportunity for students to visit geological sites around the world. He has also created the Robert Quartermain Geology Scholarships, and provided a leadership gift in support of the Quartermain Sports Medicine Centre, housed within the Richard J. CURRIE CENTER. In recognition of his outstanding achievements in the resource industry and his unfailing support of his alma mater, Dr. Quartermain was awarded an honorary degree from the UNB in 2009.